As we edge ever closer to the release of Power Rangers Dino Force Brave in South Korea the first Youtube review of its unique mecha has surfaced! 쿠라 KOORA brings us a look at the DX Brave Tyranno King toy (which will be renamed Kyoryuzin Brave in Japan). The mecha is a remould of the previously released DX Kyoryuzin, sporting a new colourscheme alongside new weapons for all three components. The video review also features a look at the toy’s electronics, which may be changed for the Japanese release. Power Rangers Dino Force Brave will be released in South Korea on 1st April, with the Japanese equivalent Zyuden Sentai Kyoryuger Brave following on 14th April! 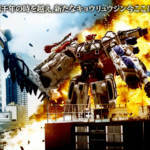 In case you missed it, a sequel series to Zyuden Sentai Kyoryuger will be made for the Korean market as Power Rangers Dino Force Brave(Zyuden Sentai Kyoryuger Brave in Japan), a whole press conference event was held last week and since then toy catalogue scans for Korea’s first original Power Rangers adaptation have been released online. The latter five seems to all but confirm that Korea will be getting a dub of Zyuohger at some point in time but we’ll have more on that once more info becomes readily avalaible. Power Rangers Dino Force Brave is set to air this April. Power Rangers Dino Force Brave Press Conference Photos Online! 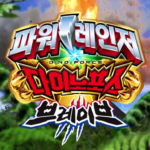 A little while ago, we learned that Korea will be producing it’s own adaptation of Zyuden Sentai Kyoryuger under the Power Rangers Dino Force Brave name. Since the announcement, a plethora of photos from a recently held press conference have been released online, where we get to see most of the Korean actors for the show in costume. Along with that, we also get photos of the toy line. While most appear to be just straight repaints of their respective Kyoryuger toys with a few modified pieces, though a new DX Kyoryujin set was shown along with two new Zyudenryu. Power Rangers Dino Force Brave is set to air beginning of April and will run for 12 episodes. In addition, an article by tokusatsunetwork.com reveals the cast will be comprised of various K-Pop singers along with Koichi Sakamoto himself will be involved with the project, each episode will have a run time of 12-15 minutes. On occasion TokuNation has the opportunity to share galleries of rare items that aren’t often seen in the toku collecting communities of the world, and today is no different. For your viewing pleasure we’ve assembled a gallery of a rarity from Hyakujuu Sentai Gaoranger, the gorgeous DX Silver Chrome Gao Gorilla! Silver Gao Gorilla was a promotional release from 2003, 2 years after Gaoranger ran in Japan, & distributed exclusively by Bandai Asia/Hong Kong. It wasn’t an item regularly available for retail sale. Numerous sentai release in varying chrome colors have made their way to market in this nature over the last 2 decades. This rare piece pops up for sale on occasion but is still notoriously hard to find. The 4th of 5 versions of the Gao Gorilla Power Animal mold, Silver Gao Gorilla will add some serious bling to your collection, and especially to your Gao Muscle or Gao Knight display! We’ve attached a selection of images to this post but you can check out over 30 which await you in the full gallery/review thread. 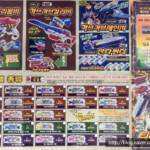 Just click “Discuss on the TokuNation forums” at the bottom of this post to see them all. Ressha Sentai ToQger’s begun airing in Korea under the Power Rangers Train Force name, and a it seems that a rather peculiar item’s been spotted with a gold colored DX ToQoh having seen in the wilds. At the same time, the same product’s been spotted in Hong Kong where they’re also airing dubbed ToQger as a Toys R Us exclusive item. For those of us overseas, the DX Gold ToQoh’s occasionally been spotted on Ebay for varying prices. Hopefully, with this item being released in Hong Kong it will become more widlely avalaible. The wild ride is over, Power Rangers Wild Force/Hyakuju Sentai Gaoranger month has come to an end with this final Gallery! 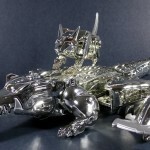 And today we’re taking a look at a very special release, DX Gao Hutner Silver Chrome edition! This promo set was only available in mainland Asia as a part of a special giveaway. It swaps nearly all plastic colors for silver chrome aside from some key points which feature flat grey plastic instead. These releases were not packaged in a complete boxed set like normal Gao Hunter but were instead released only in individual boxes. So thanks so much for sticking with us throughout this long month of tributes and photos! Next month we close the year with Power Rangers Megaforce & Super Megaforce! To celebrate we’re going to be bringing you complete galleries of the entire DX line from Kaizoku Sentai Gokaiger! 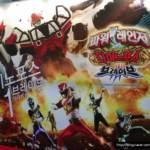 We reported just a few days ago that South Korea would be getting Tokumei Sentai Go-Busters as Power Rangers Go-Bursters. Now thanks to TokuNation.com member shikishima we have some more details to share along with the fact that Kamen Rider Fourze will also be airing alongside Power Rangers Go-Bursters in South Korea! Daewon Media, a South Korean company that specializes in cultural content, is responsible for bringing over Power Rangers Go-Bursters and Kamen Rider Fourze to that country. 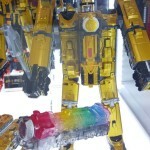 Along with the shows will be imported toys, action figures, and accessories for both shows to the South Korean market. If you missed your chance at getting some of the swag from these series when they were airing in Japan, this is now your chance! A big special thanks to TokuNation.com member shikishama for this news!